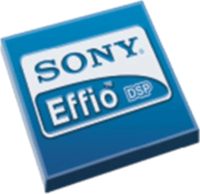 "Effio" means "Enhanced Features and Fine Image Processor", and it is a Sony signal processor which realizes high resolution, high S/N ratio and high color reproduction for security camera. Analog Output Y/C separate, Comp. Y/C separate, Comp. Y/C separate, Comp. "Super HAD CCD II" "Super HAD CCDII" "EXview HAD CCD"
"EXview HAD CCD II" is a trademark of Sony Corporation. The "EXview HAD CCD II" is a CCD image sensor that realizes sensitivity (typical) of 1000mV or more per 1µm2 (Color: F5.6/ BW: F8 in 1 s accumulation equivalent) and improves light efficiency by including near infrared light region as a basic structure of Sony's "EXview HAD CCD". 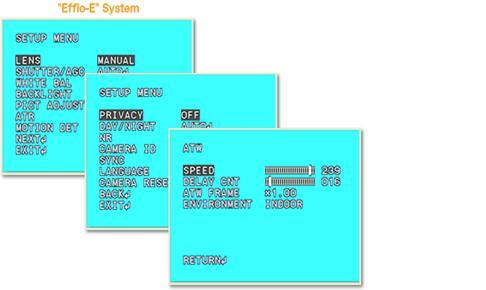 Measurement method is refered to JEITA (TTR-4602B).